When Joey Logano arrived in the Sprint Cup Series in 2008, he came stamped with a “can’t-miss” tag. When he moves to his new gig at Penske Racing next year, he will do so with a new tag in place; one which reads “can-salvage”. During a Wednesday morning teleconference with the media, both Logano and his new boss expressed confidence that the move from Joe Gibbs Racing to the Penske organization will put the 22-year-old driver on the track to the success that many had forecast for him when he was still in high school. “I think the way I am personally,” Logano said, “I think I work very hard and I expect a lot out of myself. I don’t think I ever accomplished everything I always want to because I’m shooting for the moon. I think if you shoot for a top‑10 finish, the best you’re ever going to do is get a top‑10 finish. You’re always wanting more. They call me greedy, but I think that’s the competitiveness in me, to always want to be better. “When I started in the Cup Series, I got thrown into it at a very young age with very, very little experience, not knowing what I was getting myself into. I learned a lot. I feel I am at a point in my career that I know what it takes to go out there and do it. Tim Cindric, president of Penske Racing, said, “I think it’s hard to understand someone’s situation from afar. Really, we kind of know what we read and what we see. “But the dynamics inside the team are a lot different than what the perception is. It’s hard to make a judgment on that. “I felt like, and obviously Roger did, Brad did, really the other members of the our team – Mike Nelson, Travis (Geisler) – what Joey just seemed like from the outside and from that point in his career we felt that we could hopefully provide him with an environment that he could be successful in and continue to grow his confidence. Logano, who has been driving the No. 20 Cup car for Gibbs since 2008, will fill the seat that belonged to A.J. Allmendinger when the current season began. That seat was shifted to Sam Hornish Jr. after Allmendinger was suspended by NASCAR for failing a drug test. Allmendinger was subsequently let go by the Penske team and Hornish was given the ride for the remainder of the season. Team owner Roger Penske said at the time that he would evaluate the long-term future of the No. 22 ride. The results of the evaluation process were made public this week as Logano was given the job. Cindric said that Logano’s character played a big role in filling the seat of a car which has been plagued by driver problems the last couple of years. Hornish, a three-time IndyCar Series champion and a winner of the Indianapolis 500, will continue to drive the Penske Racing No. 12 Nationwide Series car full time next year. Cindric said the hope has been to put a deal together that would result in a full-time Cup ride for Hornish but to this point, sponsorship has not been found. During a Tuesday teleconference, J.D. Gibbs, president of Joe Gibbs Racing, spilled the beans on the Logano-to-Penske deal when he said that he and his team were sorry to see Logano go but understood the young driver’s desire to take the Penske job rather than drive in Nationwide for JGR. 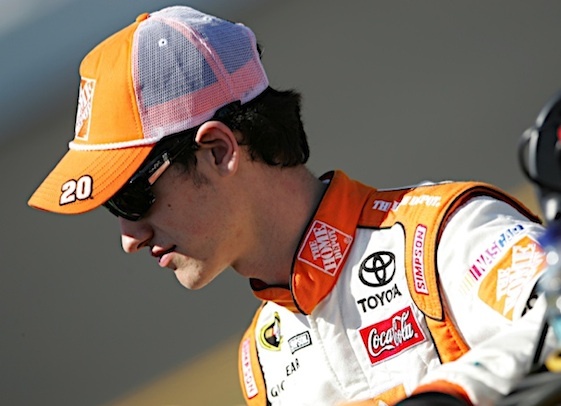 Logano arrived in NASCAR as a teen-ager with a reputation already in place. Highly respected veteran driver Mark Martin told the racing world that Logano was ready for a Cup ride at a time when Logano was just 15 years old. Logano has won two races in 136 Cup starts. One of those victories came in a rain-shortened race at New Hampshire Motor Speedway in 2009. The other came at Pocono earlier this year. Logano has 16 top-five finishes and 37 top-1os. He has been unable to earn a Chase berth despite driving for a JGR team for which teammates Kyle Busch and Denny Hamlin have made runs at Cup championships. But, Logano has been much more successful in the Nationwide Series, where he has six victories this year alone. Both Logano and Penske think the change of scene will also change Logano’s fortunes.